Yam plantlets at the aeroponics screen house are growing at an exponential rate after being exposed to sunlight! Also, vines pruned from the aeroponics system and planted into soil are producing shoots within 2 weeks. This is good news for yam growers as it takes 4 to 6 weeks for normal vines from field plants to develop shoots. Dr Norbert Maroya, the principal scientist on the development of the aeroponics system for seed yam production, said that the YIIFSWA project is planting over 1800 one-node vine cuttings (in soil) from vines produced in the system to produce mini-seed yam tubers. He said he is excited that the shoots at the screen house were developing within 2 weeks of planting. national agricultural research and extension systems, private seed companies, and farmers involved in producing certified or quality declared seed yam. 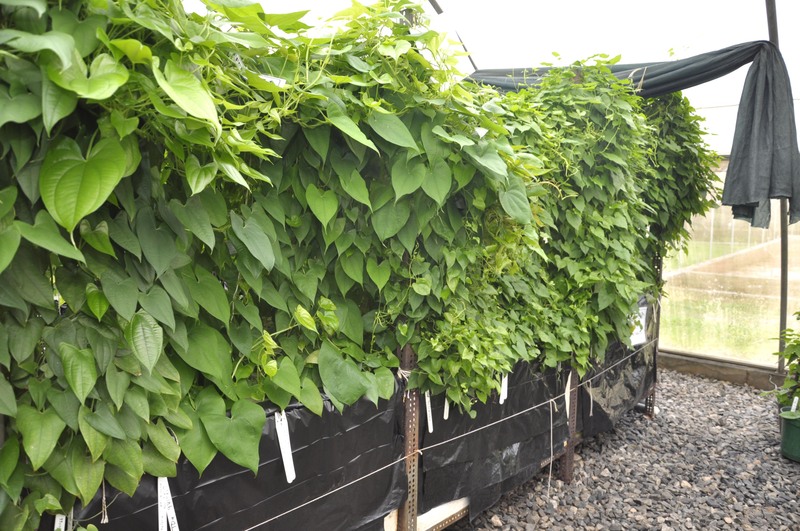 Aeroponics screen house transformed into a dense forest of entwining yam vines. its a good development and would like to learn more about the technique behind the process. This is an opportunity for millions of jobless African youth, it’s going to be a welcome development if,action could be expediently taken in order to serve as both hunger and poverty combatant.